We are a theatre, artistic, non-profit organisation that was founded in 1985. Our board of administration of AEROPLIO consists of many well-known people of Literature and the Arts that have a substantial work in the Greek Artistic Area. • Has participated in foreign Theatre Festivals like Munich , Paris , Ankara , Helsinki. London & Chelmsford-England, Plovdiv-Bulgaria, Washighton DC-USA Melbourne-Australia,. Augsburg-Germany, Kiev-Ukraine. 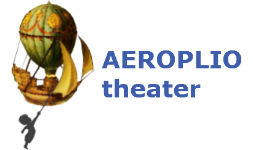 September 2016 AEROPLIO THEATRE enter its 32nd year of rich and creative course in Theatre activities. We will continue to produce performances for children and adults in our venue. A renovated Neo-classical building of 1925 of 450 m2 with two theatre spaces that will host 220 and 60 people accordingly. The name of the theatre is TOPOS ALLOu (means : a place elsewhere) and is a full equipment theatre building which presents performances for adults and young people.